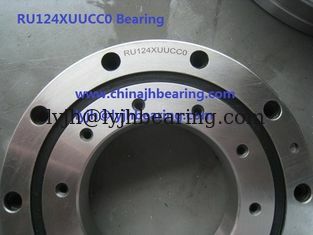 RU124XUUCC0 roller bearing belongs to RU Model Crossed roller bearing structure,Since the mounting holes are provided,this model does not require a presser flange or housing. In addition,Because it has an integrated inner/outer ring structure and is equipped with washers,Its performance is minimally affected by the mounting procedure,ensuring stable rotation accuracy and torque.This model can be used for both inner-ring rotation and outer-ring rotation. RU124XUUCC0 bearing application: industrial robots, machine tools, medical equipment and other machinery requiring high rigidity and superior accuracy in a compact footprint.